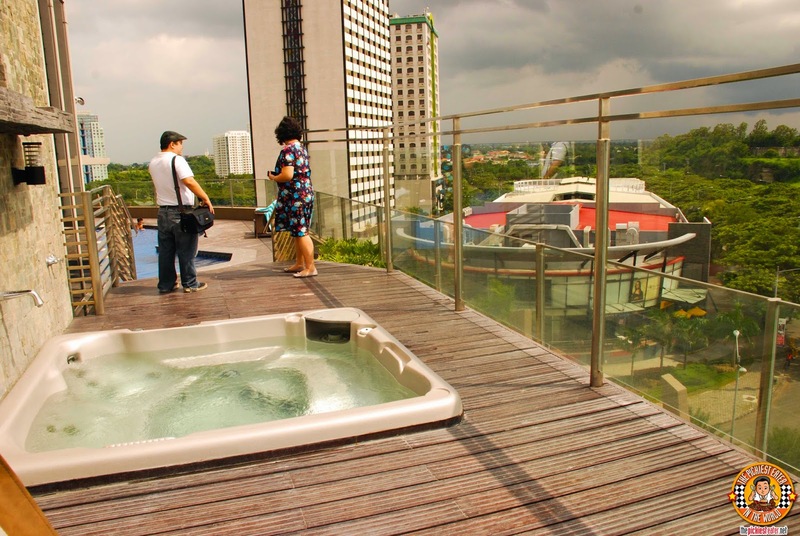 Among the other hotels I had stayed in at Alabang, I think it's safe to say that Acacia Hotel has the best location. 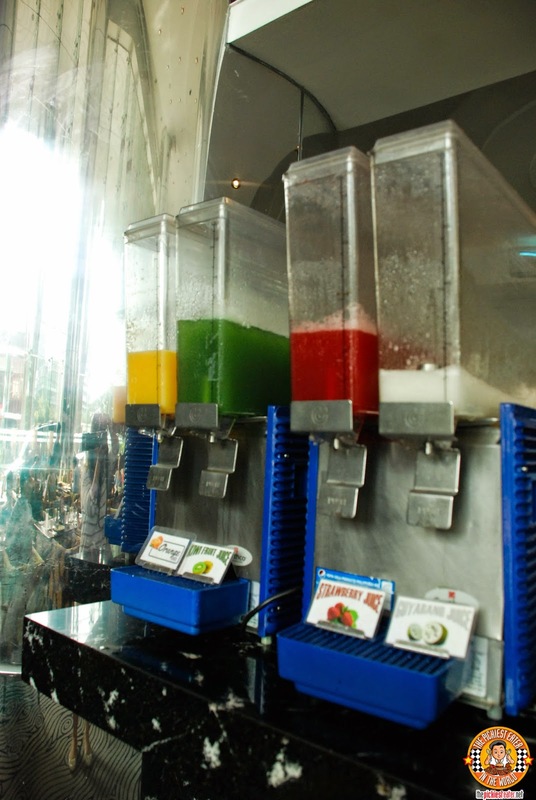 You are literally across the street from Commerce Center, which is an emerging mall, and just a stones throw away from Westgate, which is known for its dazzling selection of restaurants. When we arrived at the Hotel, we were informed that the establishment is currently undergoing a few improvements, and that the lobby wasn't finished yet. In case you were wondering what it used to look like, you can check out my post on Acaci. 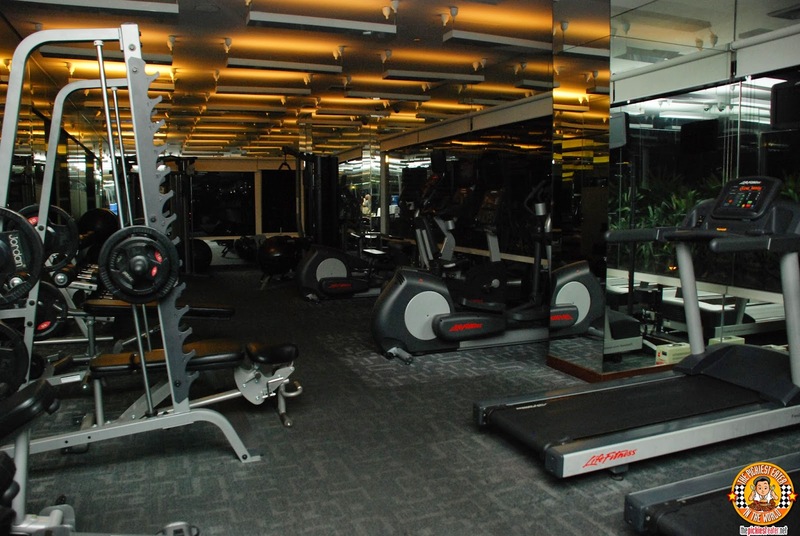 Acacia Hotel's hospitality and service can stand toe to toe with the best hotel establishments in the country today. 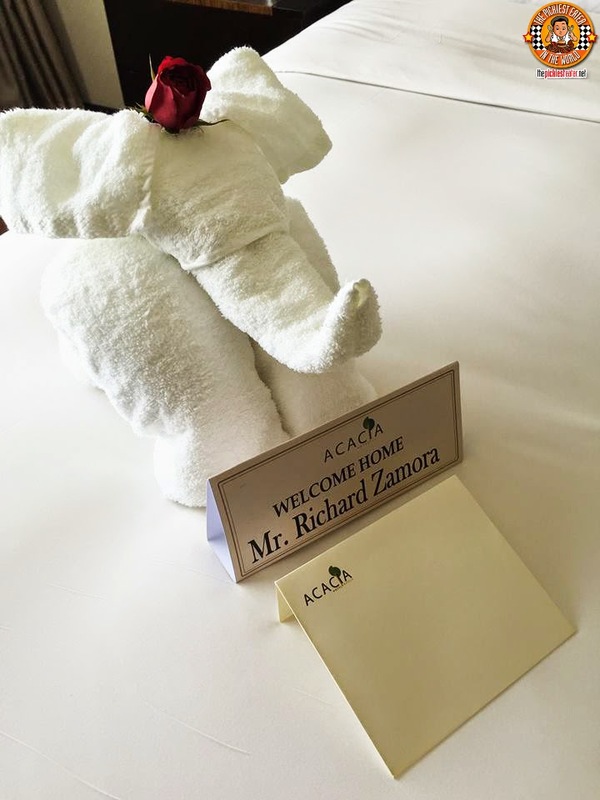 As we entered the room, we were greeted by an adorable towel Elephant, that proudly welcomed me and my family to our "Home" for the night. As Rina was taking pictures, the Towel Elephant caught her eye, and she used her cat-like reflexes to hop on the bed and reach out for it! Since we weren't done with the photos yet, I exclaimed, "Rain, No!" in a panic. 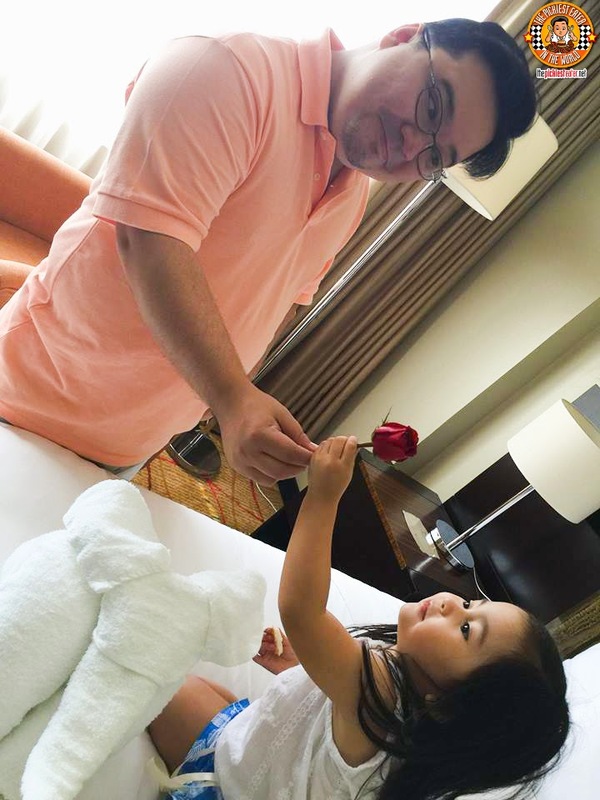 As a smooth "palusot", Rain grab the rose from the Elephant's head and said, "for you Daddy!". 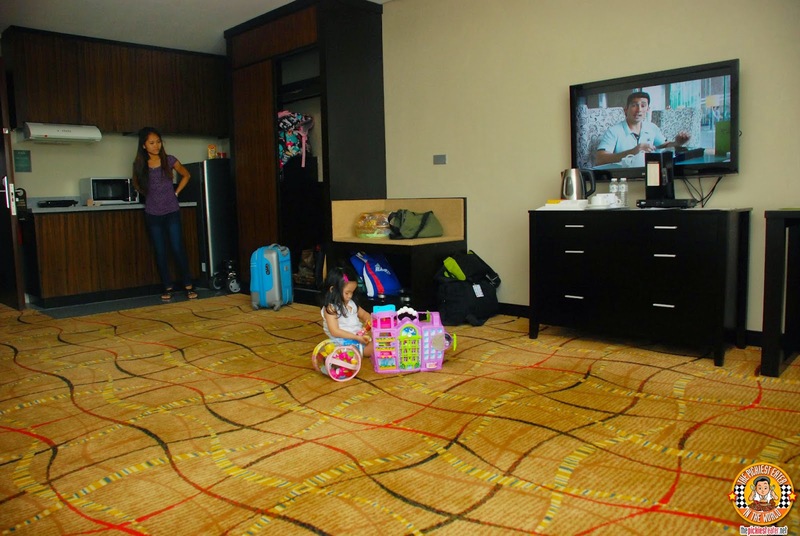 We were billeted in Acacia's Executive Suite, and it was pretty huge in terms of floor area! 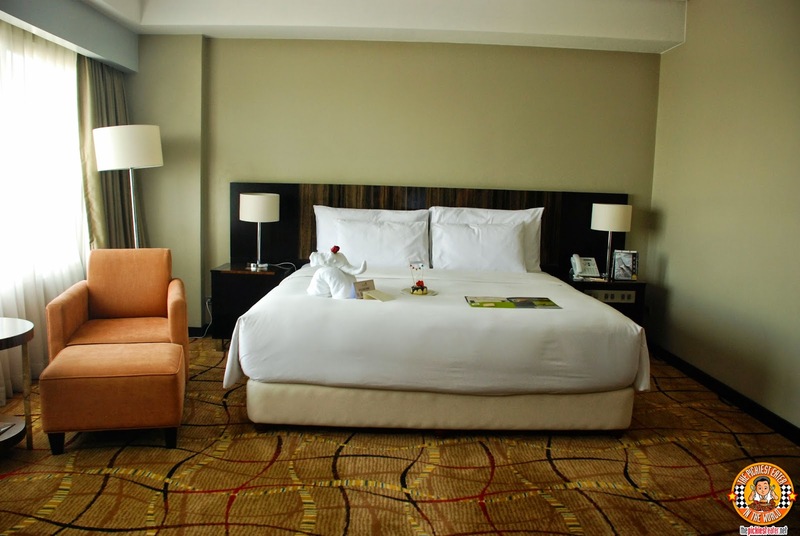 The sleeping area room is equipped with an incredible King sized bed (More on that in a bit), and a comfortable lounge chair, perfect for reading, giving you a spectacular view of Filinvest Business Park. I'm gonna go ahead and say it..
Acacia Hotel has THE BEST BED I've ever had the pleasure of enjoying. 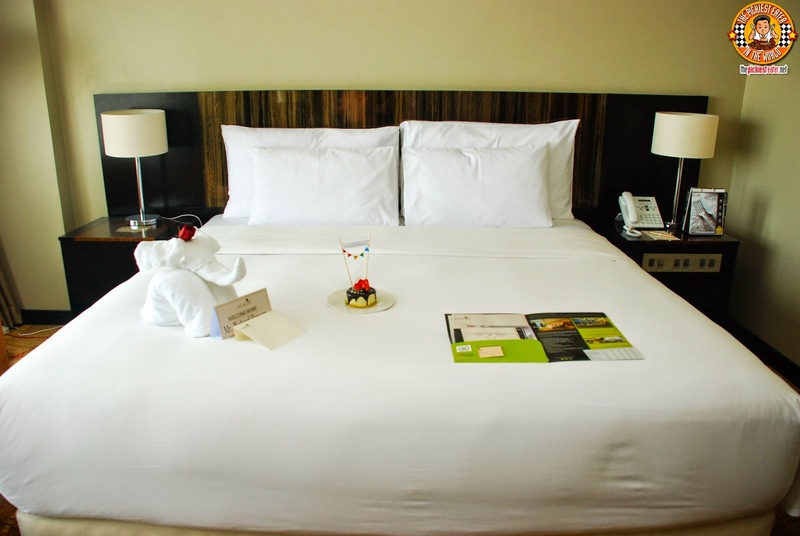 Every room is equipped with a "Dream Bed" - an orthopedic bed topped with a layer of memory foam. The Memory Foam seemed to mold itself into the outline of my body, making me feel like a sink into a soft, fluffy cloud of incredible softness. This bed could very well ruin every other bed for you. It's to a standard of excellence that very few beds can match. As I mentioned the floor area was so wide, Rina and I contemplated playing a game of badminton before dinner. Seriously though, Yaya's bed was placed by the side of the wall, and it in no way hampered the size of the room, giving Rain more time to play with her Pinypon (Acacia?) Hotel. 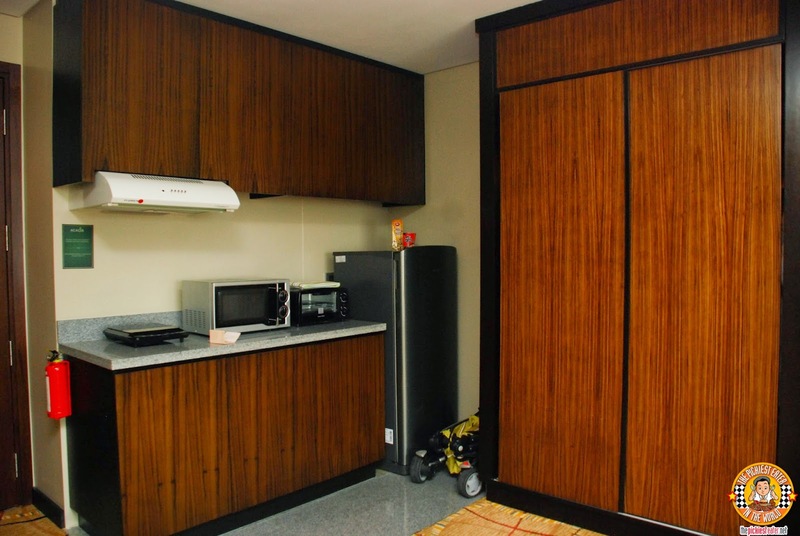 The Executive Suite has a Kitchenette, which is equipped with Essentials such as a Microwave, Refrigerator, Toaster, Burner and even an exhaust. This was really perfect for us because Rain's finicky appetite would often lead to her eating at erratic times.. Having a microwave and a toaster on hand made it easy to heat up her food when her hunger strikes. I have two "comments" about the room, that are technically quite minor. The first comment is that the TV remote control wasn't there, making it hard to use our Media Player (The only remote that was there was for the cable). It's really no biggie but Rain has the tendency to demand for a certain cartoon ("Sophia The First", "My Little Pony", etc..), and we need to be prepared. The second qualm is that their bathrobes are a bit too tight. I was just about to hop into the bubble bath when Spanky rang the doorbell. I grabbed the robe and tied myself up, then opened to door, not realized that I looked like this. The horror in Spanky's face was apparent, realizing that there are some things that you just can't unsee. 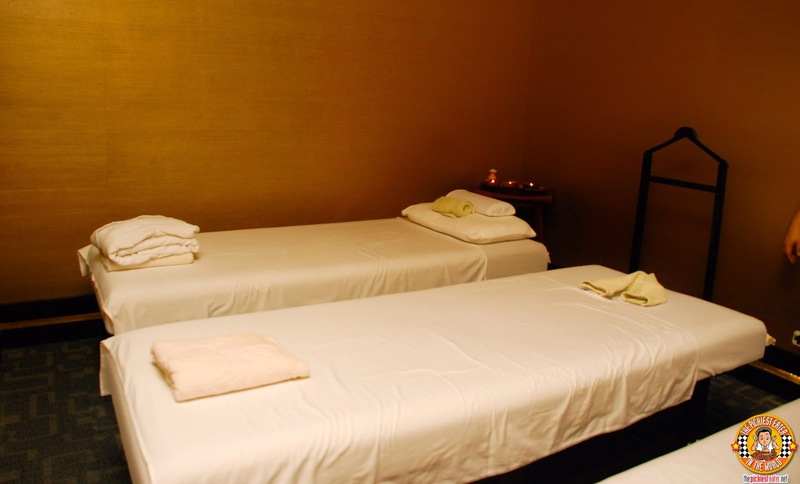 Before calling it a night, Rina and I dropped by Lurra Wellness Spa for a relaxing couple's massage. The Couples room was simple and cozy, and with the perfect ambiance for relaxing. 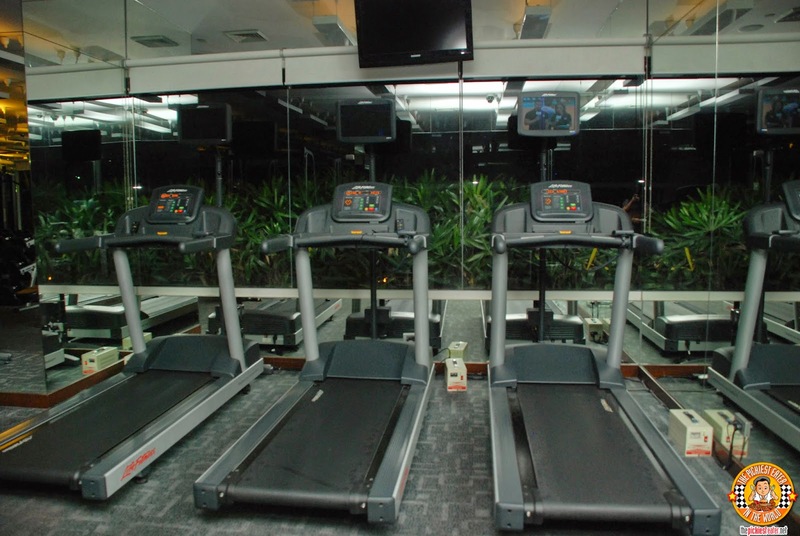 Acacia Hotel also has a well equipped Fitness Center that is set up with the essential weights and cardio machines. 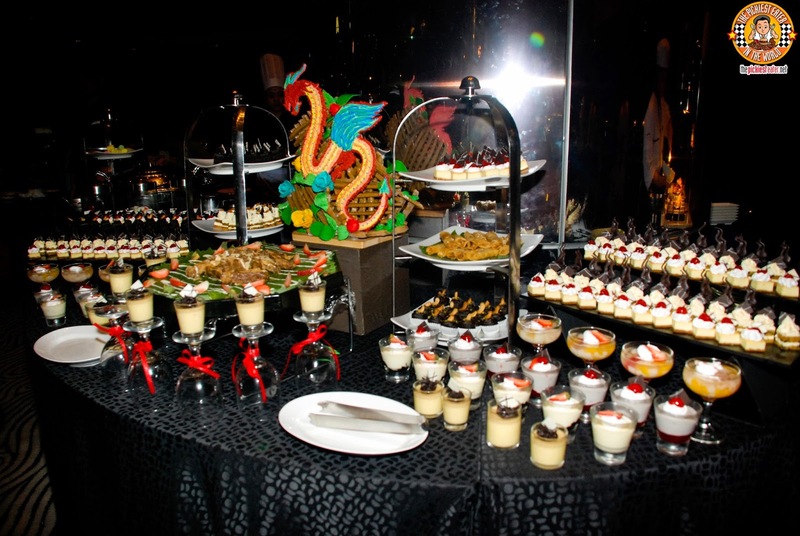 Acacia Hotel houses numerous ballrooms and meeting rooms, which can serve as perfect venues for events. 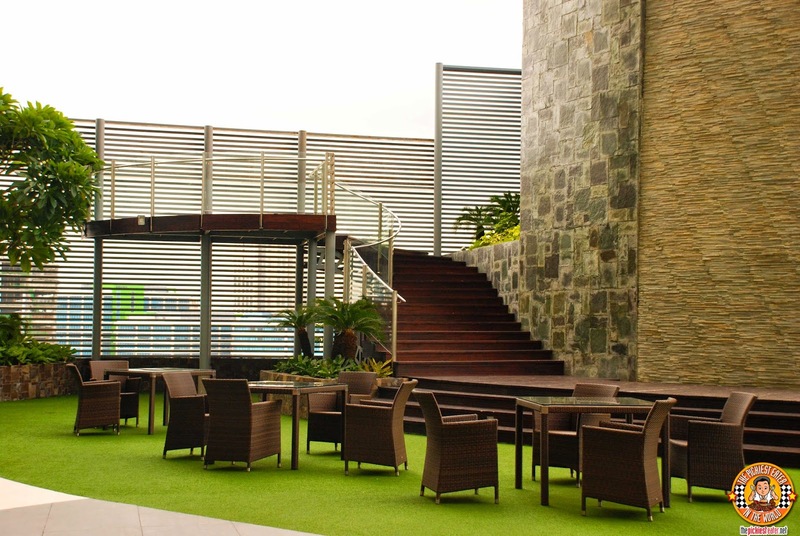 One such venue that you should look at is the Samanea Garden, that makes for a perfect setting for a beautiful outdoor party, with a view deck giving you a glimpse of the bustle metropolis outside. The area can hold up to roughly around 100 people. 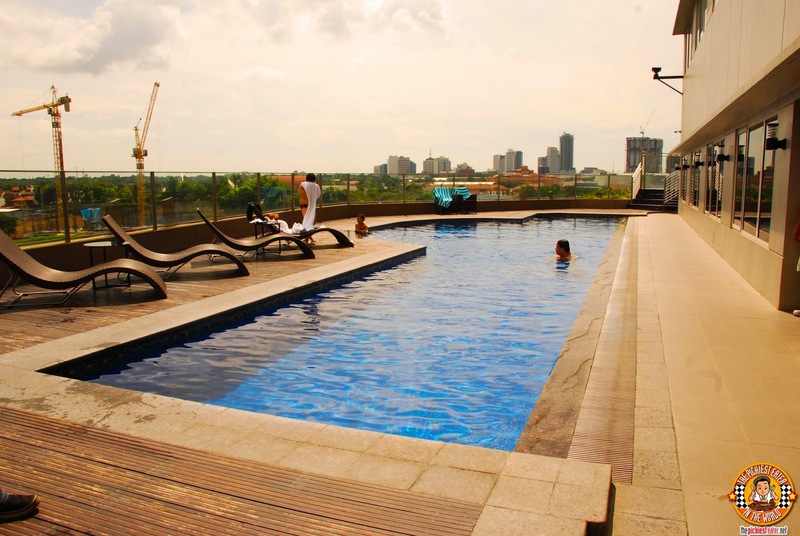 Acacia Hotel's swimming area is divided into three different areas.. 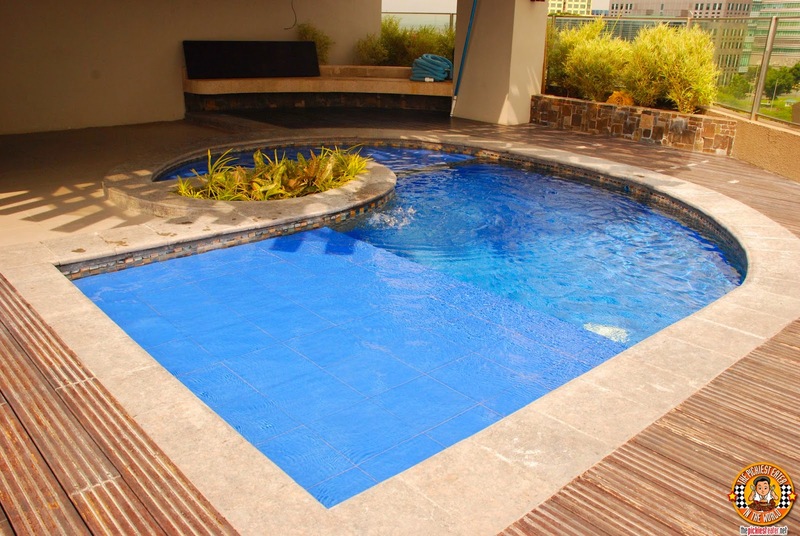 The first is the lap pool, which caters more for adults. 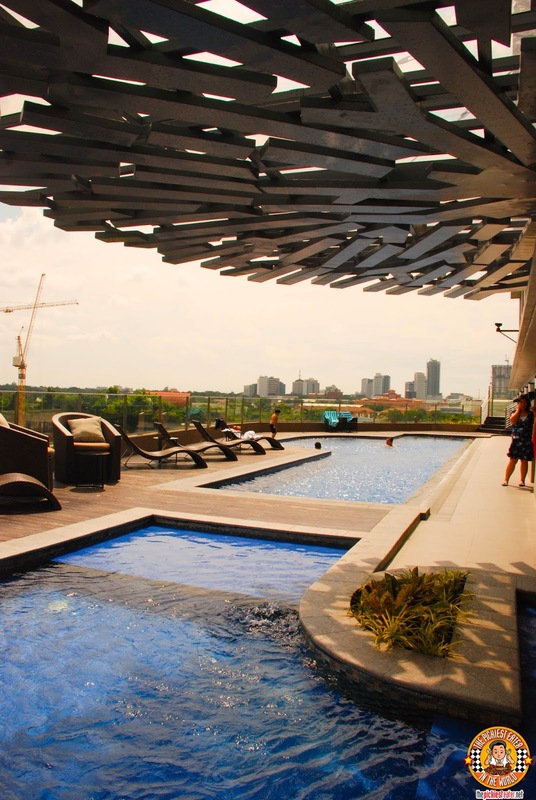 The pool is relatively narrow and reminiscent to the lap pool of F1 Hotel..
Beside it is a smaller, more shallow pool for children. The highlight for me though is Acacia Hotel's Hot Tub, which is filled with warm jets that lets out gentle blasts of water, that becomes quite soothing on the muscles. And as you can see, my daughter didn't think it was a pretty sight either. 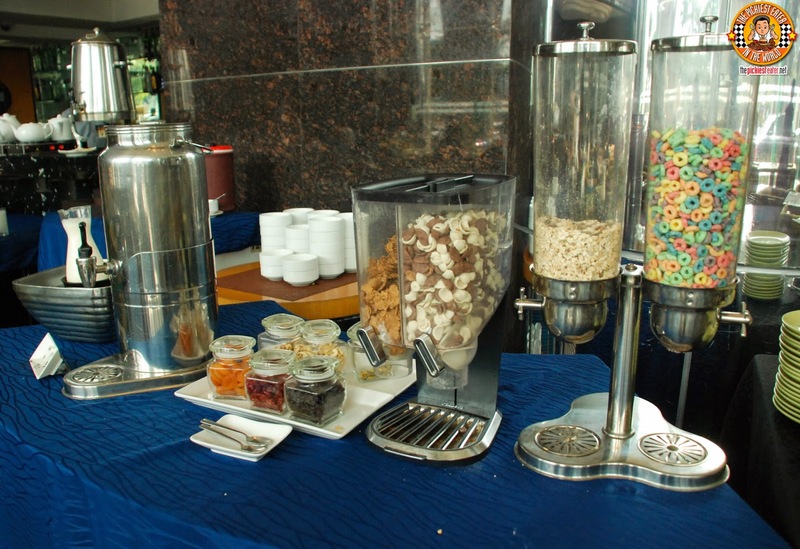 Since Acaci was still under renovation, the meal time buffet spreads were situated at the lobby area. 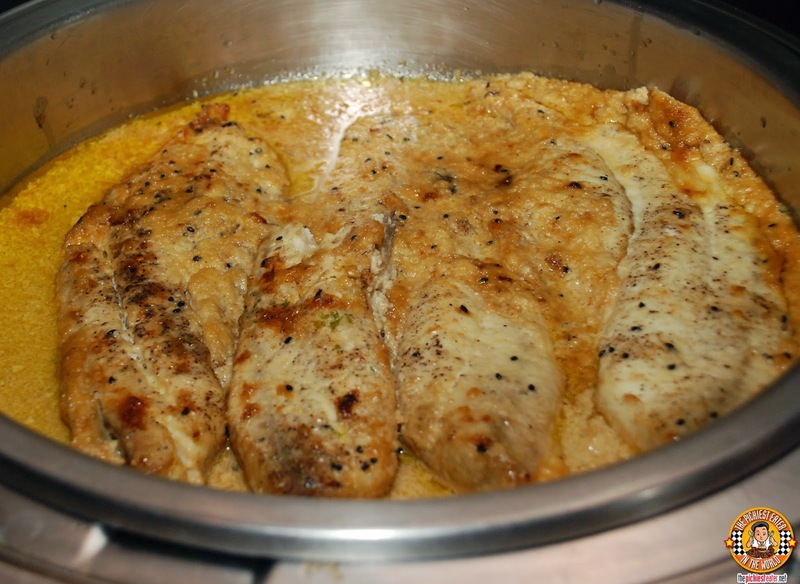 I'm sharing with you the highlights from our Dinner and Breakfast meals! 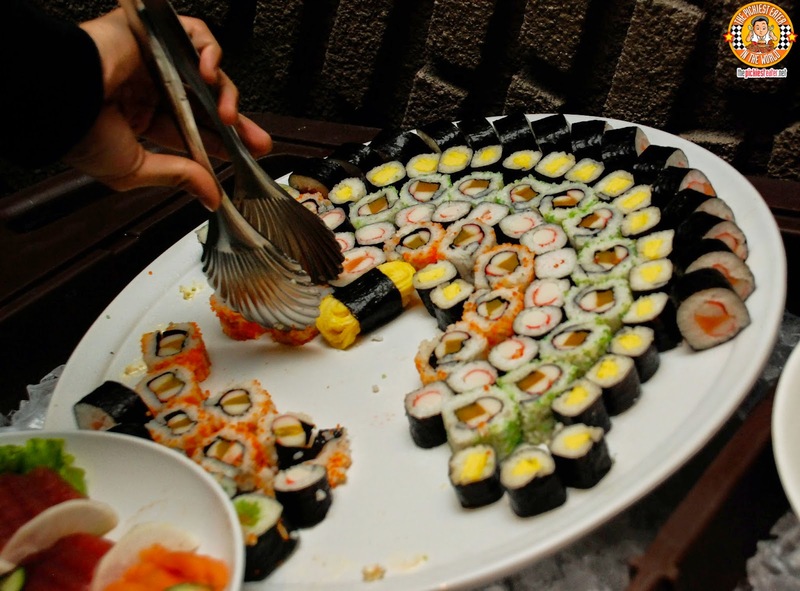 Rina always goes for the sushi rolls whenever we're at a buffet, and she was quite pleased with Acacia Hotel's selection. 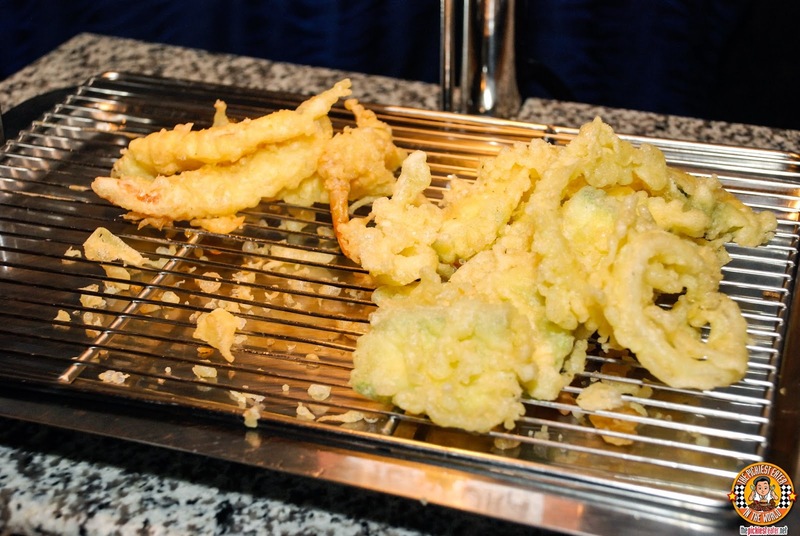 Not only did they have Shrimp Tempura, but they also had mixed vegetable tempura as well. The Oriental Sesame Baked Snapper was quite delicious..
And the Grilled Beef Tenderloin in Red Wine sauce was extremely flavorful, with the thin slices of beef remarkably soft. But my favorite dish of the evening had to be the US Angus Short plate. 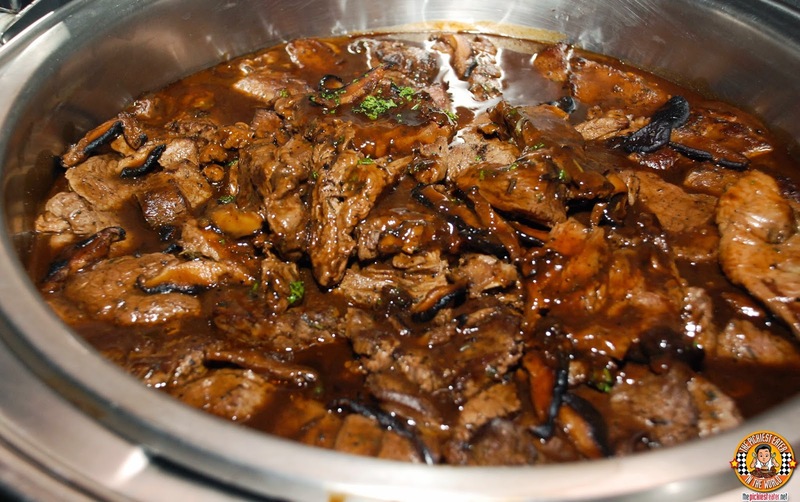 The meat was soft and had a nice punch of smokiness to go with its gorgeous lining of fat! Acacia Hotel had a nice selection of pastries to choose from, including some that were served in honor of the Chinese New Year, including the intriguing Lumpiang Tikoy! 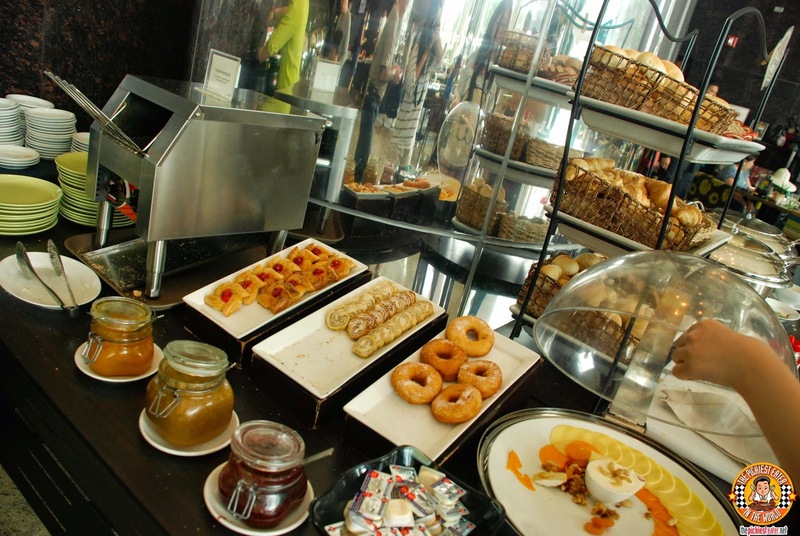 For breakfast, I first attacked the bread station. I'm a sucker for those sugar raised donuts, and their danish pastries were quite tasty as well. Rina, on the other hand, likes starting the morning with a bit of cold cuts and cheese. Rain was elated with the selection of Cereals! Acacia Hotel's Bacon isn't among the best I've tried, but it is still bacon, nonetheless and therefore deserves a spot on this post. 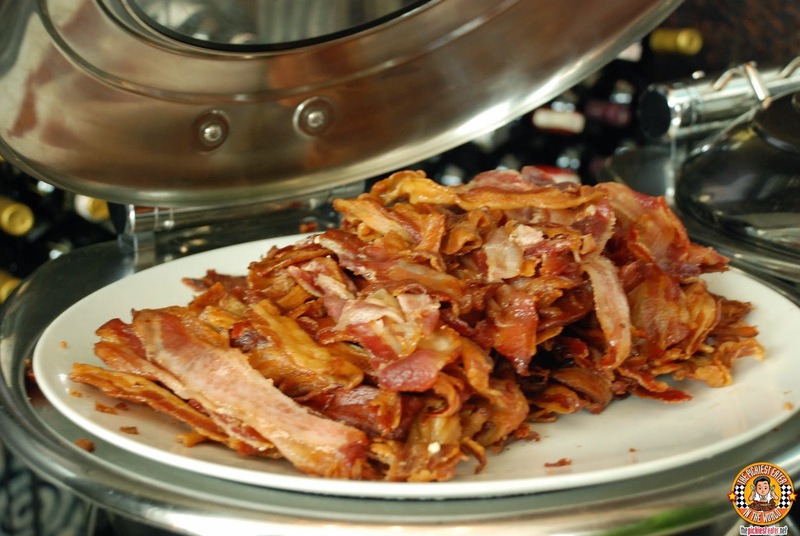 What I liked was that the kitchen staff made sure to keep the bacon coming, fully aware that this was the buffet's hot commodity. 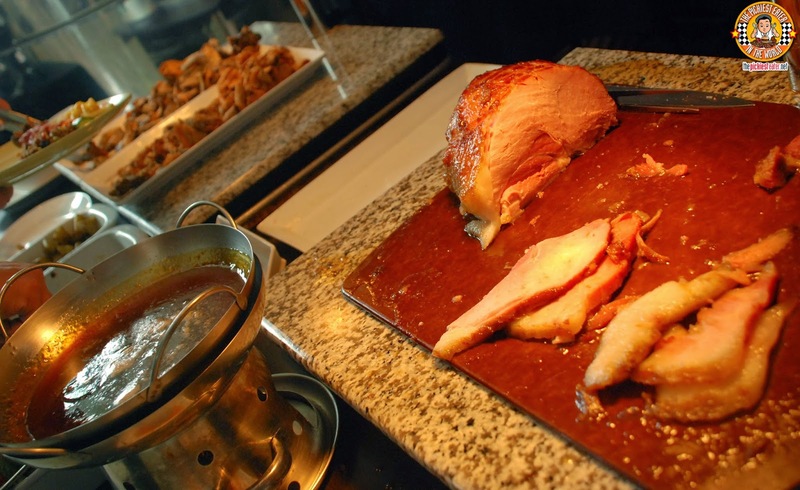 Another one of my favorite entrees of Acacia's breakfast buffet, was their Pineapple Glazed ham. It was meaty with a nice touch of fat, and a tinge of smokiness, and served with an optional sweet pineapple sauce that complimented the meat perfectly. On the whole though, I think Acacia's food can stand a bit of an improvement, but with the opening of A Steakhouse within their premises, I have no doubt they're on their way. 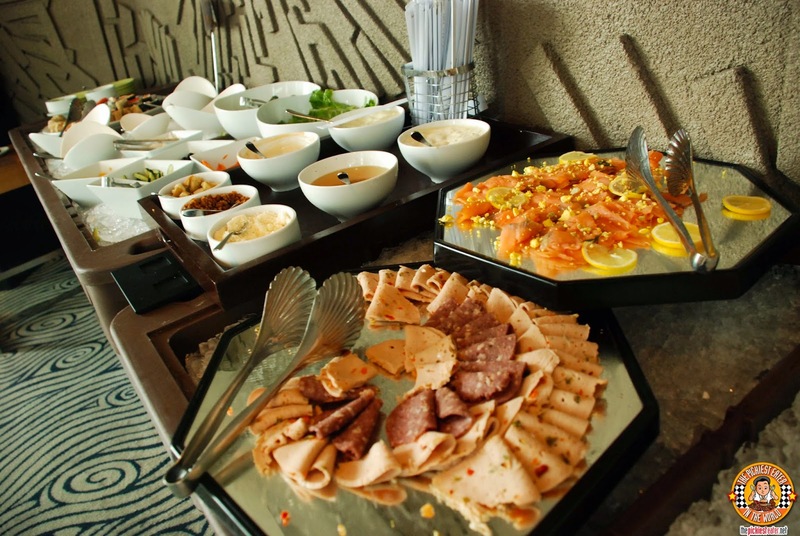 With the group behind Enderun now manning the kitchen, its only a matter of time that the quality of the food catches up to the other facets of the hotel that are exemplary, such as the service and accommodations. The comfort of their beds are unparalleled. The service of their staff is outstanding. An establishment such as Acacia Hotel makes you proud to be a Filipino. 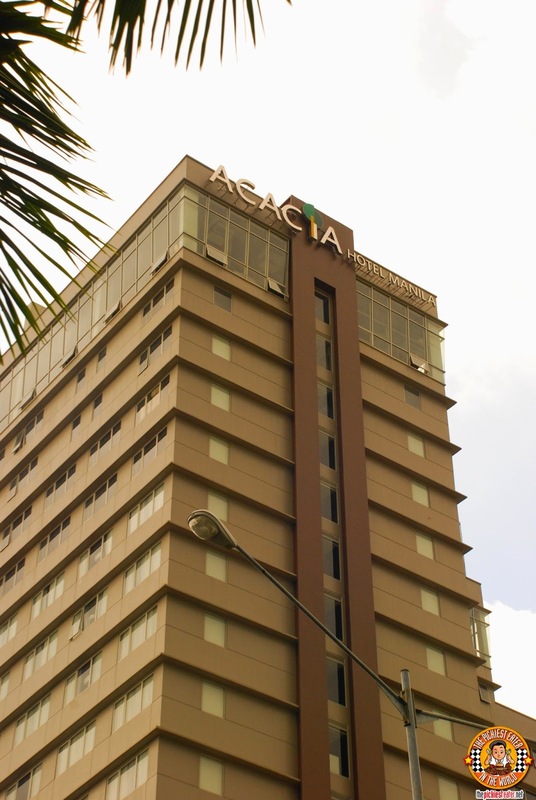 It's world class service would make you feel that this was an international chain, but Acacia Hotel is proud to be an independent Filipino Hotel brand. 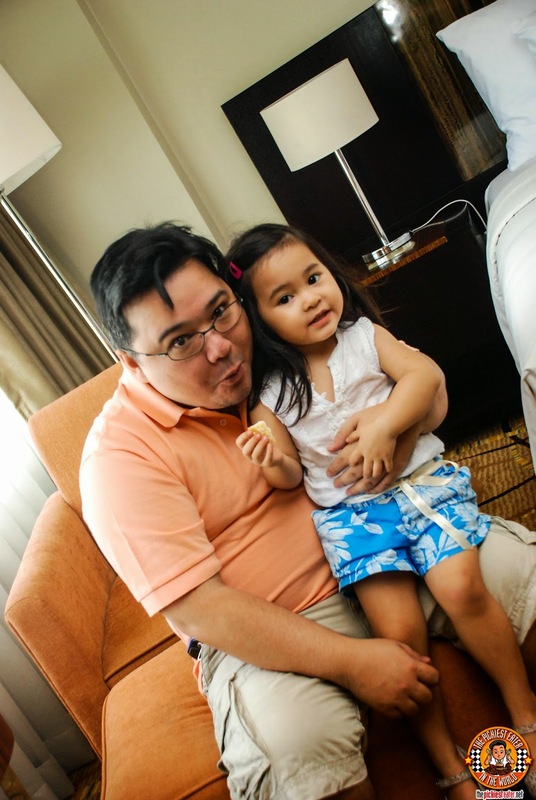 Acacia Hotel should most definitely be taken into consideration when choose what hotel to stay in at the Calabarzon area! Thank you again Queen Jane for tagging me along! Wouldn't have been able to stay here without you.. Thanks for remembering me! Like Acacia Hotel on Facebook!